Our organic Gunpowder green tea is a form of green Chinese tea in which each leaf has been rolled into small round pellets. It is believed that Gunpowder green tea gets its name from the fact that the tea resembles gunpowder pellets used for cannons. The tight roll helps Gunpowder Tea remain fresher longer than other teas. This tea has a sweet and slightly smokey character. It is also known as another type of Bi Luo Chun Green Tea. Rich in fluoride, calcium, and anti-oxidants - and with very little caffeine - this is a perfect choice to greet the evening. The taste is clean and with a sweet refreshing aftertaste. 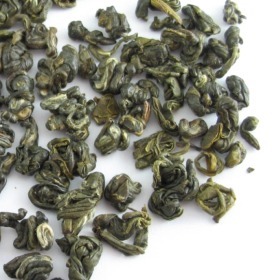 The tea leaves are partly covered with white down and rolled in pellet shapes. This is much better than your typical gunpowder green. Its actually fairly thick, sweet, and floral, with a light character. It makes for a good everyday green.